Hector International Airport is pleased to bring you ArtWORKS at the Airport, an on-going series of exhibits that showcase the work of regional artists. Art expresses who we are as a community and some of the values we share, including creativity and thoughtfulness. Whether you are a visitor to the region or returning home, we hope the art exhibited here gives you a welcoming sense of place. You can see the exhibition near baggage claim. 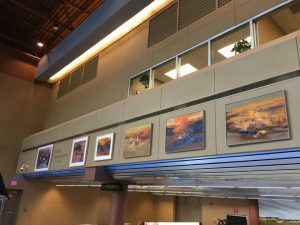 The latest series includes six abstract landscapes by painter and Minnesota State University, Moorhead art professor Zhimin Guan. The dramatic rock formations of the Badlands – and the magnificently theatrical forces of the weather that passes over that region – inspired the paintings included in “Grand Abstractions.” Through large gestural marks, form, color and shape, Guan has captured the essence of the austere beauty of western North Dakota.